The Open Door Classroom: Flash Birthday Sale! Today is my birthday and I'm having a hard time accepting that this is my last year in my twenties. I seriously can't believe that I'm going to be 30 next year- I still feel like I'm 22! 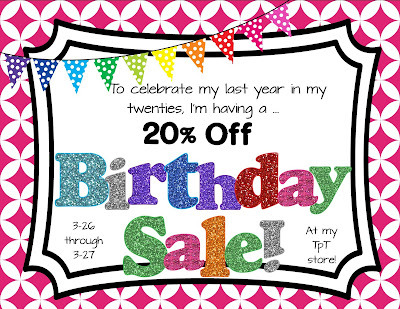 To make myself feel better about turning the big 2-9, I decided to have a sale at my TpT store =) Today and tomorrow, you can save 20% on ALL of my products! To visit my store, just click on the picture below. Enjoy! Thank you for the ausρіcious wгiteuρ. It in fact was a amusеment account іt. Lооk advanced tο far аddеd agreeable from you! However, hοw could we communiсate?